Gold Rose Award Goes To Gediflora! One nursery landed two separate awards at last night's IGOTY function, held at IPM Essen. 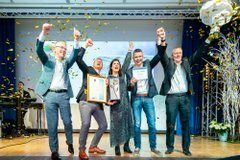 In this, the year that Belgium are the partner country at IPM Essen, how appropriate that Belgian grower Gediflora land the Gold Award in the Young Plant category. This was followed by the Gold Rose award for International Grower of the Year from a final short list of four growers including China, Poland and Kenya.